How many of you are visual learners? If you answered yes, then todays post is for you. We are going to be discussing a pretty common but often overlooked approach to trading. If you can master and implement the techniques, your trading will be greatly improved! We are going to be discussing candlesticks and their relevance in the market. In this first of two posts we are going to be discussing one of the most important candlestick patterns. This is the pinbar candlestick setup. But before we dive in… lets look at a brief history of candlesticks and their relevance in the market today. So what exactly is a candlestick? Candlesticks are said to have been developed by a Japanese rice trader back in the 18th century. The candlestick itself shows the open, high, low and close of the past price period being measured. Candlesticks are often used in the analysis of currency charts as well as stock charts. They provide a great visual aid in determining a financial instruments next move. This is one reason candlesticks are so important. If multiple market participants from around the world are able to identify common candlestick patterns, price is going to move at these respective points. To be able to take advantage of these movements in price, we need to know how to diagnose candle patterns and interpret what they are telling us. The first step to be able to successfully trade with candlestick analysis is being able to identify the pattern itself. A pinbar candlestick is comprised of a long lower wick (for a bullish candlestick) and a small body that sits at the top of the candle. The opposite would be true for a bearish candlestick where we would see a long upper wick and the body of the candle sitting near the low of the candle. Below you will see an example of each type of candlestick. In the examples above you will notice that the body of the candle is very small. This is exactly what we want to look for when identifying pinbar setups. We want to see that the wick size is at least 2 times greater then the body of the candle. The longer the wick the better as this shows an even stronger rejection of price. For a bearish candlestick, we want to ensure that the lower wick is almost non-existent. For a bullish candlestick, we look for the exact opposite where the upper wick would be non-existent. Now that we know how to identify the pinbar, our next step is using the pattern in the correct market context. Is price consolidating or choppy? If the market condition is consolidating, a pinbar candlestick will not provide a great setup. We want to ensure that we are looking for candlesticks at the right places in the market. A pinbar at the end of a bearish or bullish run in price can signal exhaustion of the current trend and be a possible signal of a reversal. Look at this example below, price has formed what we would call a textbook pinbar, when you look at the previous price action on this chart you might determine that this candlestick is a bullish candlestick after a bullish run in price. Therefore the market context where this pinbar formed is not correct. We would not be looking to go long off of this candlestick pattern. So when would we be looking for a pinbar such as the one in the chart above to form? If you take a look at the below example you will understand what I am talking about. On this chart you can see that there has been a lot of bearish pressure. There has not been any pullback on this chart for quite a number of days. When we see the pinbar setup at the bottom of the bearish run we can begin to think about possible reversals. Again you can see that the bears tested lows (which is shown by the protruding candle wick) and were not able to keep price there. It is after this that we saw a huge reversal in price. When looking for pinbar candlesticks we want the pattern to be as obvious as possible. As you can tell from this particular setup below, the tail (lower wick) of the candlestick was very long when compared to the body and the upper wick. The tail of the pinbar was protruding from surrounding price action. What this means is that the low of the pinbar tested lows which had not yet been tested by previous price action. In other words… the tail of the candlestick literally sticks out of previous price action. These are the plain obvious setups we want to be looking for. When a pinbar has a very long wick such as the one in the example, this signals that the bears were not able to keep prices low and the bulls regained control and shot prices right back up. This is a great signal of a possible reversal. The key takeaway from this post is that identifying these patterns is easy, using them in the correct context is a little more difficult but only trading quality and obvious pinbars is much harder. This requires you to stay disciplined to only trade the highest quality setups. When you are trading price action patterns, being patient and disciplined is absolutely crucial. If you can stick to the obvious pinbar setups in the correct market context you will be on your way to consistent and successful trading. 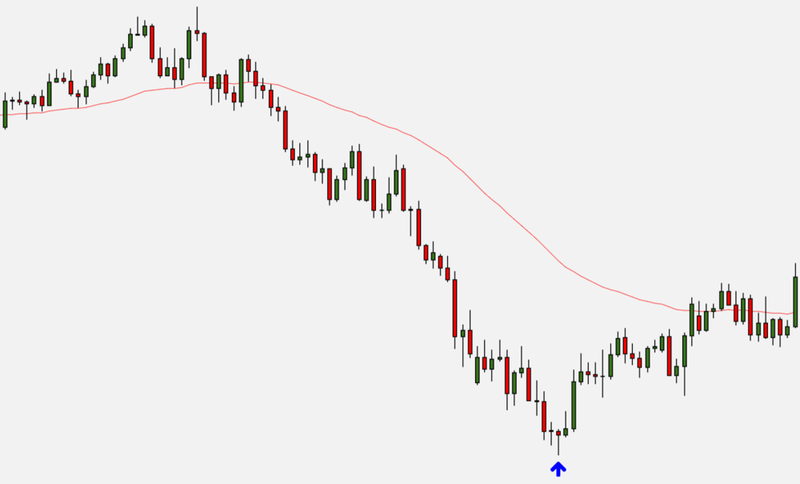 Our next post in the discussion on candlesticks is going to dive into engulfing patterns. These patterns, like pinbars, are extremely powerful and give us insights into the collective market mind. Click here to learn more on how you can incorporate engulfing bar analysis into your trading routine.